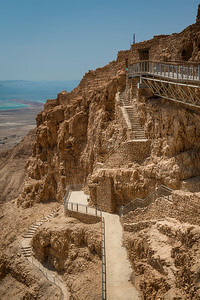 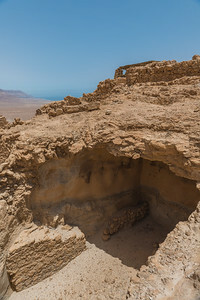 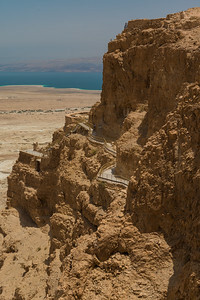 Masada is an ancient mountain-top fort built by Herod the Great in south Israel located on the eastern edge of the Judaean Desert, overlooking the Dead Sea. 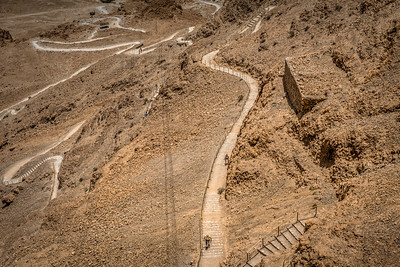 Stairs and pathways leading up to the summit of the mountain-top Fortess of Masada in the Israeli desert next to the Dead Sea. 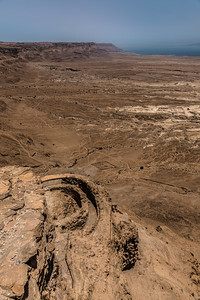 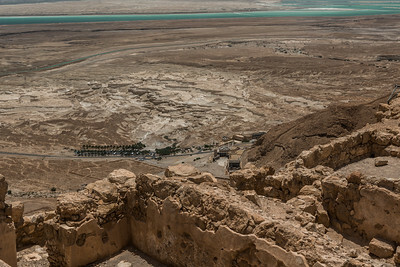 View of the Jordanian coast, Dead Sea, desert and Masada national Park tourist center from the top of the Masada fortress in Israel. 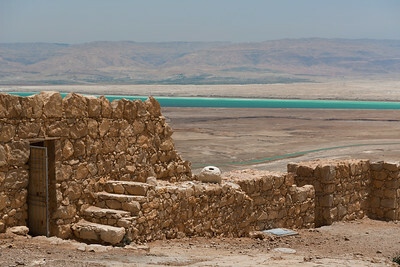 Close up of irrigation canals in the fortress of Masada in the Israeli desert near the Dead Sea. 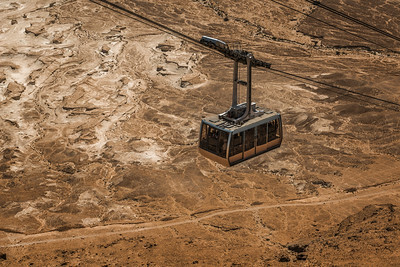 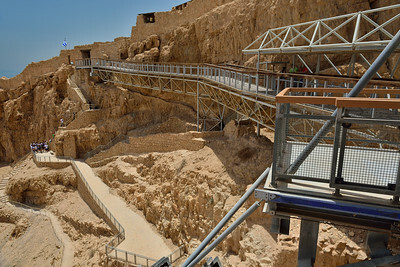 Gondola car ascending to the fortress of Masada in the Israeli desert. 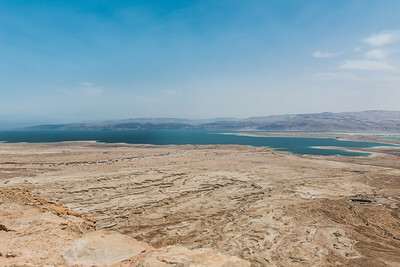 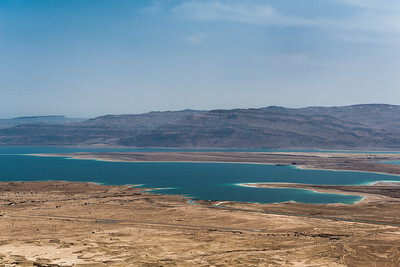 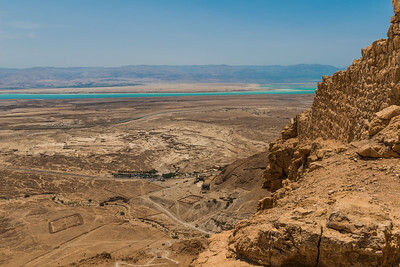 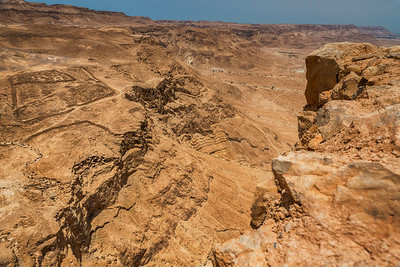 View of the Jordanian coast, Dead Sea and desert from the top of the Masada fortress in Israel. 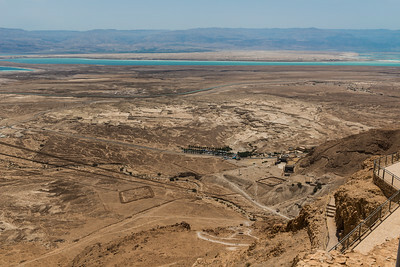 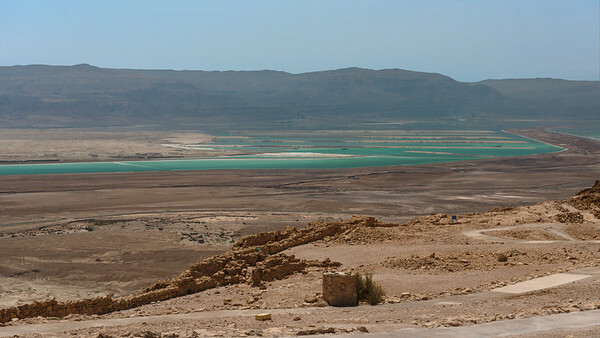 View of the salt flats south of the Dead Sea as seen from the Fortress of Masada in Israel. 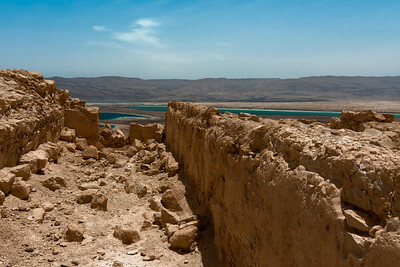 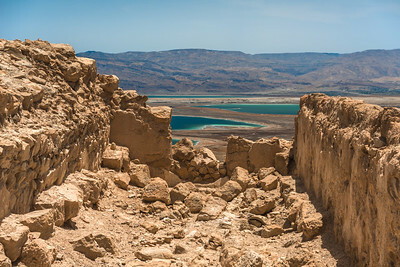 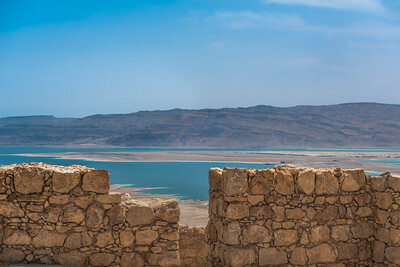 View of ancient fortress walls at Masada with the Jordanian coast, Dead Sea and desert visible in the background. 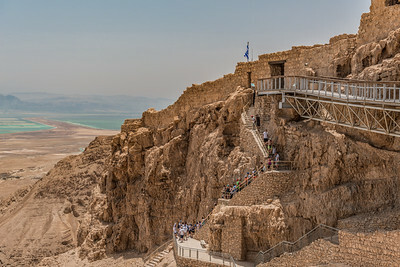 Masada National Park in Israel. 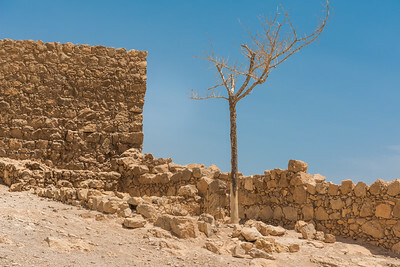 Fortress walls and lone tree at the summit of Masada in Israel. 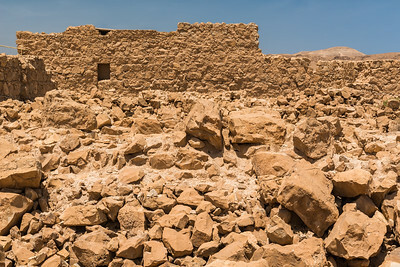 Ruins at the mountain fortress of Masada in Israel. 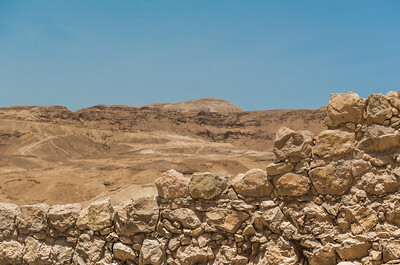 Stones located below the black line are from the original fortress. 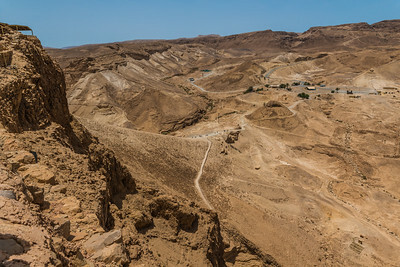 View of the ruins of Herod's Palace as seen from the summit of the Fortress of Masda in Israel. 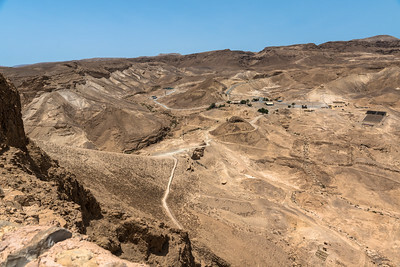 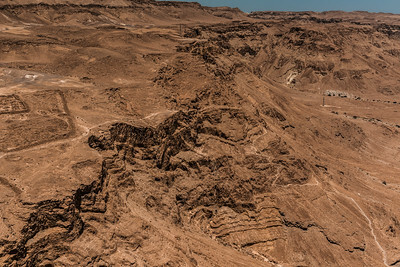 View of the desert floor and part of the Roman camp at the base of Masada in Israel. 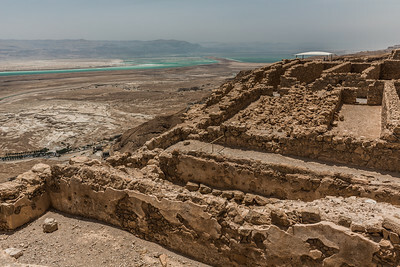 View of the Israeli desert mountains to the northwest of the fortress, from the summit of Masada. 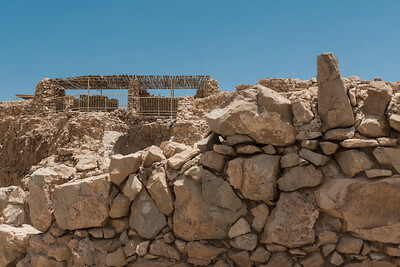 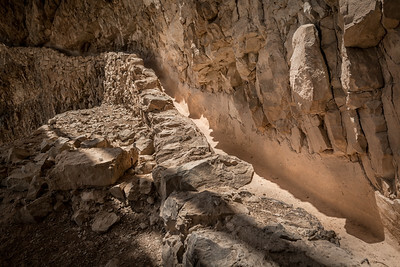 Detail of the archeological ruins of the fortress of Masada in Israel. 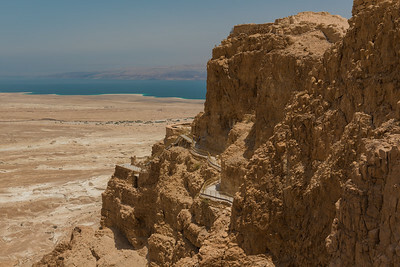 Side view of the cliff of Masada where Herod's palace once stood, with the Dead Sea and Jordanian coast visible in the background. 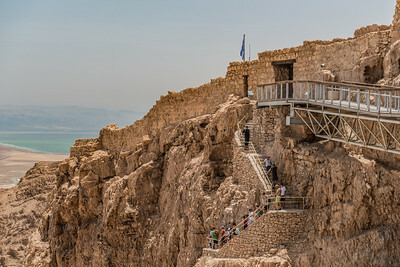 View of the ramp built by the Roman legion to attack the summit fortress at Masada Israel. 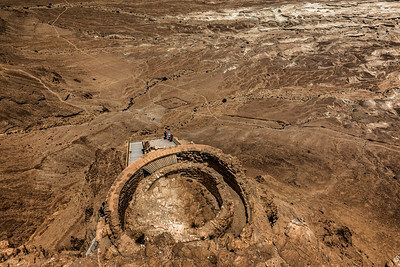 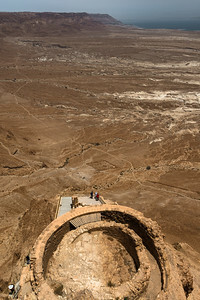 Covered meeting area at the summit of the fortress of Masada in Israel. 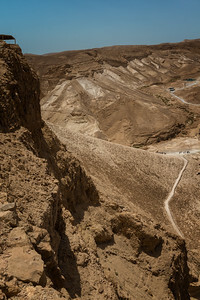 View of the Roman legion's camp and valley separating it from the mountain fortress of Masada in Israel.